Can the World Cup End U.S. Cultural Hegemony? When I was 17 I spent the summer in France on an exchange program, living with a family in an idyllic town in Normandy, parlando the language of Napoleon and Camus (OK, so my conjugations may be a bit off, it’s been a while) and doing my best to avoid eating cheese, which wasn’t easy seeing how it was both a national and regional obsession. My French “parents” seemed to think it was incroyable and pas possible that someone would come all the way to France for a summer and not eat cheese (my attempts to explain that j’aime pas le fromage everywhere fell on deaf ears). I can still hear my host, taking out his beloved box of Calvados cheeses at the end of every dinner and muttering about it—rather unpleasantly at that. But away from the dinner table, I had a far easier time assimilating with the natives than most of the other American kids in my study program. That’s because I played and shared the French kids’ obsession—le football. Not only could I make friends by playing in the park, but also, as a result of having grown up in Mexico, I had a reservoir of shared experiences and knowledge binding me to French kids that my American classmates simply did not have: the World Cup. The World Cup has provided a tidy punctuation to my life every four years, and in the summer prior to my Normandy adventure, the most memorable match of the Spain 1982 World Cup was the French semifinal overtime loss to the Germans in Sevilla. Even a year later, by pretending I had been rooting for the French (oui, Michel Platini, c’est magnifique) and grousing about how dirty the German team had played (Schumacher, c’est un cretin), I could score big points and fit right in. While I had been thrilled by the German victory, few words roll off the tongue (or more like the depths of your throat, come to think of it) as well as “cretin” does in French—and it’s true that Schumacher, Germany’s goalkeeper, had almost killed Patrick Battiston on a play the French are still talking about today. Two things strike me about these memories, one of which remains very true and one of which has changed drastically eight World Cups later. Soccer (like religion) remains one of the few non-American narratives binding the world together. When it comes to global pop culture, if it isn’t the latest World Cup or European Champions League, the only things kids in France, Mexico, Ghana, and South Korea typically share in common are U.S. imports: Hollywood blockbusters, American TV series, music, video games, and the English language. The NBA and NFL have gained followings overseas, but sport still remains the weakest link in America’s hegemonic control over global culture. What’s changed drastically since my summer in France, however, is American involvement and engagement in the global game. The United States may not dominate or drive world soccer, but it is increasingly participating in it, thanks to the interest of both affluent white suburbanites and immigrant groups. Back in the 1980s, hardly any Americans followed the World Cup. You could mind your business in most U.S. cities and never know that much of the rest of the world was at a standstill, absorbed in one month-long obsession. The U.S. national team, a perennial laughingstock, didn’t even manage to qualify for a World Cup between 1950 and 1990. Now, by contrast, the United States boasts a highly respected national team that easily qualifies for the World Cup every four years; a decent domestic league established as a legacy of the 1994 World Cup played here; and armies upon armies of youth soccer players. And far more people in the United States watched the Spain-Netherlands final of the 2010 World Cup (24.3 million) on TV than watched the decisive fifth game of Major League Baseball’s World Series that year between the Texas Rangers and San Francisco Giants (15 million). Heck, only 4 million more people watched Game 7 of the Celtics-Lakers NBA Finals that year than the World Cup final. Remember, the match we’re talking about pitted Spain against Holland. Kicking a ball around. Equally impressive, and more important in the long run, is the proliferation of media outlets for international soccer. And that’s not just every four years. NBC airs English Premier League matches, and a number of cable channels serve up games from the German, Italian, Spanish, and Mexican leagues every weekend. A generation of young gamers, meanwhile, are hooked to FIFA on their Xbox or Playstation. I for one console (or delude?) myself that when my kid is seemingly lost to the hypnotic powers of the video game, he is actually learning about geography: The other day I caught him playing Dortmund against Valencia. What a country we could be if the next generation knew where Dortmund is! Or at least Valencia. Soccer may never come close to challenging the NFL’s primacy, but it doesn’t need to go that far to become an integral part of American life, and for the United States to become an integral part of global sport. It’s hard to exaggerate how much soccer’s incursion into American life threatens to erode American exceptionalism, not to mention our traditional geographic illiteracy. American kids now routinely wear the jerseys of teams in places like Barcelona and Munich, much like their counterparts in the rest of the world. 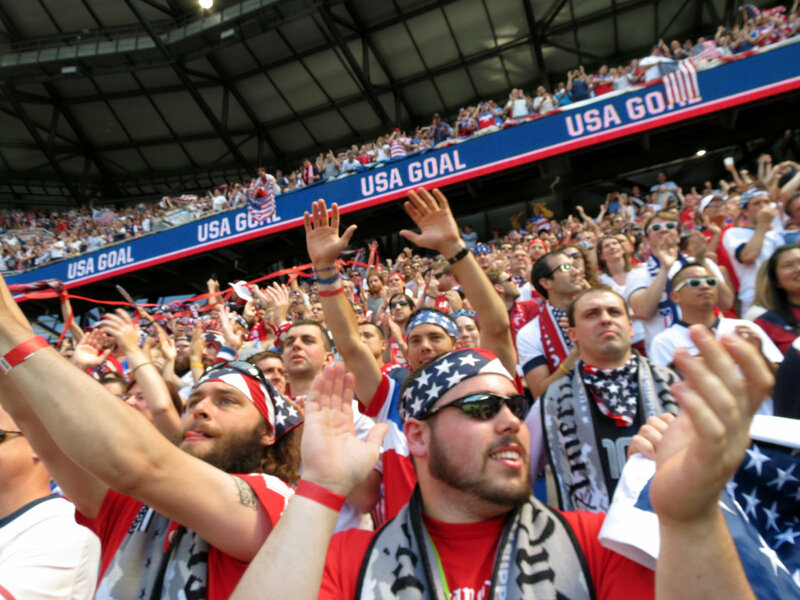 Soccer offers American sports fans a sense of global, not just national, connectedness. But all that is changing. With the World Cup in the Americas for the first time in 20 years, the United States will experience this year’s tournament in a big way, and the exciting narratives that spin out of it will help bind young American fans to cheese-eating kids in Normandy, and elsewhere. Andrés Martinez is Washington editor of Zócalo Public Square.